11:09 ET - Avs beat writer Adrian Dater tells fans 'don't go to bed just yet' with regards to Matt Duchene trade rumours. 10:48 ET - Sounds like the Golden Knights held up the trade market by putting their focus squarely on the draft. As we know, defensemen such as Marc Methot, Alexei Emelin are being dangled by Vegas. Talking are likely to continue into the evening and throughout the weekend. There's plenty of defensemen in the trade market still - Travis Hamonic, Dion Phaneuf, Chris Tanev and Tyson Barrie are generating plenty of interest. 10:20 ET - Avs and Preds talking on the draft floor. Duchene? 10:14 ET - And that's a wrap! Expect the trade buzz to continue all week in the leadup to free agency in July. 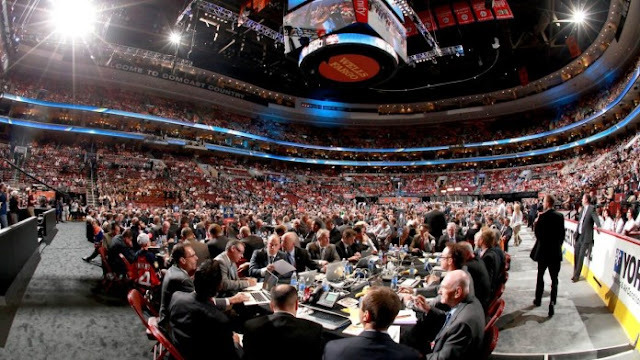 9:47 ET - The Penguins rumoured to have traded 31st overall. That can't just be for Ryan Reaves, can it? 9:38 ET - Brayden Schenn moved to St. Louis. This is a player who's been in trade rumours for years. I thought his good season had earned him a permanent spot in Philly; guess not. 9:33 ET - At last, a trade. Chicago trades 26 to Dallas for 29 and 70. 9:26 ET - Yep, Pens are indeed up to something. 9:17 ET - So quiet on the trade front. Avs haven't gotten great offers on Duchene so far - but we're not done here just yet. 8:43 ET - Penguins might be up to something. Rutherford in serious talks on the phone. 8:41 ET - Habs/Ducks in talks on the draft floor. 8:25 ET - A lot of picks coming up by teams with interest in Hamonic. Let's see what happens here with Tampa, Toronto and Calgary. 7:21 ET - Patrick 2nd. Dallas has their pick of the top defensemen in the draft, or they could move it. There's not shortage of teams looking to move up. 7:15 ET - Hischier first, which means Vegas will certainly be on the phone with Philadelphia in hopes of grabbing Nolan Patrick. Also stay tuned for Dallas at #3 - Vancouver and Colorado both want to move up. 7:00 ET - Habs keying in on Scandella. 6:52 ET - Devils and Vegas now deep into discussions on the floor. Discussing pick flipping scenarios? Devils also have their eyes on defensemen, which Vegas have in droves. 6:48 ET - Chatter at Vegas table; not a shock. With 3 first round picks in hand, Vegas would love to move up from 6th. 6:38 ET - Somewhat surprisingly, the Sens are still shopping Dion Phaneuf. 6:30 ET - Leafs-Hamonic trade talk may include Kasperi Kapanen. 5:51 ET - The Canadiens may be shopping Alex Radulov's negotiating rights. 5:49 ET - Coyotes may not be done dealing today. 5:41 ET - Sounds like the Leafs are making a major push for Hamonic. 5:36 ET - Add Tampa to the list of teams in on Hamonic. 5:23 ET - Still waiting on rumoured trades of Travis Hamonic (COL, MTL, TOR, DET, CGY+), and Marco Scandella (MTL, BOS, NYI+). 5:20 ET - Lots of chatter around the top picks in the draft. Curious to see if Vegas move up to the top two picks. They're rumoured to be after Nolan Patrick. 5:18 PM ET - Less than two hours before the draft. Lots of chatter. Already been a pretty busy day, and that should continue into the evening. Stay tuned. 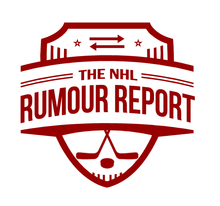 Don't forget to follow NHL Rumour Report on Facebook for the latest rumours this summer!